Visionary director Guillermo Del Toro returns to give us another masterpiece, this time returning to his horror roots. Del Toro has been known over the years to turn the ordinary into extraordinary, his latest film goes above and beyond the bar he has set in the film industry. "Crimson Peak" is an original story that revamps today’s horror genre by blending the elements of fantasy, romance and horror into one. I could go on about how authentic the story feels and how refreshing it is to see unique horror on the big screen again, but for now I’ll dive into the nitty gritty. "Crimson Peak" stars Mia Wasikowska, Tom Hiddleston, Jessica Chastain and Charlie Hunnam in some of their best performances recently. 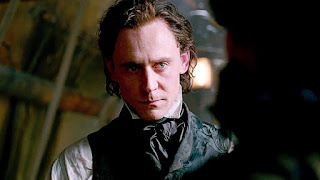 The story is set in the old times of America in which Edith (Mia Wasikowska) is swept off her feet after a family tragedy to "Crimson Peak" by a ravishing stranger (Tom Hiddleston) and his sister (Jessica Chastain). That's all that needs to be known before going into "Crimson Peak" without major points being spoiled. The story itself is unique in the sense that not many horror films these days dare to travel back to the old days of America much less incorporate how creepy and eerie day to day life was back then. Where "Crimson Peak" dares to go farther than any horror movie in recent years, is where it takes a more "Hitchcockian" route for its story. We lead in with horror, then move onto romance, then mystery all to return to the beloved horror genre once again by the end of the film. Mia Wasikowska in my opinion was perfect casting due to the fact that her style of acting is basically "Giving Just Enough" without overdoing it. Edith's character is supposed to be curious yet at the same time terrified and I think Del Toro did a great job at not only writing the character correctly, but using Wasikowska the right way. Alongside Mia, the other cast members give shining performances that seem all the more authentic as the story progresses. At first when I heard Charlie Hunnam speaking in his old timey accent it was hard for me to be sucked into the character because I could still hear his everyday tone creeping behind it. Hunnam did however go the extra mile here for me proving he does have more range than I thought. Del Toro quickly made not just Hunnam's character believable but also makes everyone in "Crimson Peak" come to life with the costume design. The old timey look doesn't look like it normally would here, it gives a description of the character before they even speak a word onscreen. The more goodhearted characters dressing in lighter and brighter clothing rather than the cold hearted characters dressing in darker clothing. I think that "Crimson Peak" was phenomenal for me due to all of those little details, even the score of the film makes the audience feel like their watching an operatic horror film instead of a simple horror movie. 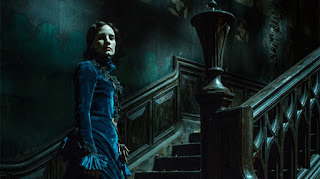 Aside from the costume design I think a lot of the credit should also go to the set designers, the set's looked immensely realistic especially when the audience arrives at "Crimson Peak". Everything in the manor seems like it was built from the ground up perfectly and then purposely made to look aged to give the authentic look that it did. "Crimson Peak" has everything a Del Toro film should have, from original writing to the effects of the film I would go so far to describe this as "Pans Labyrinth" meets "The Devils Backbone". Hiddleston and Chastain also share the screen so naturally, giving the audience an eerie sibling relationship with secrets in the midst every time they are on screen together. Guillermo isn't afraid to touch on the darker side of humanity and this film doesn't let up on that once the opening credits start. In closing I would also like to add that I'm so happy "Crimson Peak" didn't rely on jump scares to scare me. The film focuses more on those unique moments where we can scare the audience if they notice. This technique is not being used enough in horror and I think blending it with someone like Del Toro is the perfect marriage. From creative writing to phenomenal performances, Guillermo Del Toro's "Crimson Peak" is the best horror film since James Wan's "The Conjuring" and a must see for all Del Toro fans. A masterpiece to behold only in "IMAX" to get Del Toro's full effect.